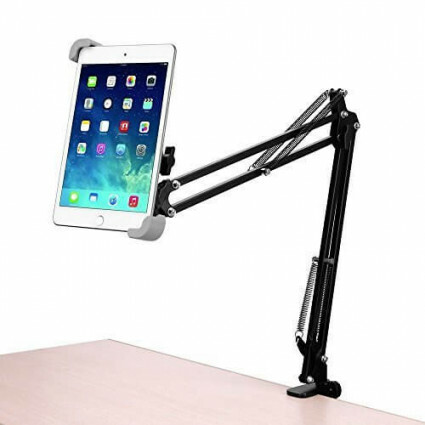 BESTEK adjustable aluminum tablet holder is 360 degree rotatable with 3 joints. You can clip the tablet support in desk or bedside table and adjust your device to the optimal view angle. It is easy to use for study, work and entertainment. Adjustable and 360° rotatable with 2-stage sing arm and 3 joints, allow you to find the optimal view angle. Universal clamp design, suitable for any 7”-10.5” tablets; clip on clamp fits for desk and any flat plane. Made of heavy duty aluminum materials, the holder is durable and stable to keep device sturdy and protected. Each joint is connected, easy to install within a few steps; clip-on type, clip and play. 18 months warranty and provide friendly, easy-to-reach support, you can buy with confidence! Compatibility: 7"-10.5" Tablet PCs, Such as: iPad 2/3/4, iPad mini 1/2/3/4, iPad Pro 9.7 inch/10.5 inch and iPad Air 1/2, Samsung Galaxy Tab series, Sony Xperia series, Acer, Fuhu Nabi, Leapfrog kids tablet, IRULU, and more .